The 7-Element Obstacle course challenges you through 7 different types of obstacles. Includes blower. Proportions: Length: 34′, Width: 13′, Height: 11′, Weight: 418 lbs. The 7-Element Obstacle course challenges you through 7 different types of obstacles. 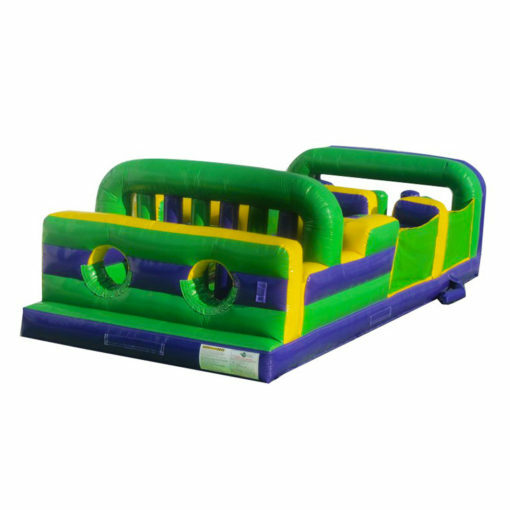 Racers start this Obstacle Course diving through the wall, then squeeze through the pillar wall, around inflated side posts, scramble through tunnels, more inflated walls and out the back to become the victor! Includes blower.